The Muslim month of Ramadan is such a special time of year to be living in the Gulf. Set aside the conspicuous logistical changes of shortened working hours, smoother traffic and modesty restrictions to ensure public decorum. For me, it’s about the spirit of reflection and unity born from the rituals of this holy period. Although I personally do not fast, I feel fortunate to be invited by those who do, to share a meal over iftar as the sun sets, and before it rises during suhour. Many hotels in town mount elaborate buffet productions in so-called tents (though virtually all are indoors) to simulate an Arabian communal feast. Restaurants also go into a different mode, with special menus designed for sharing with family and friends. 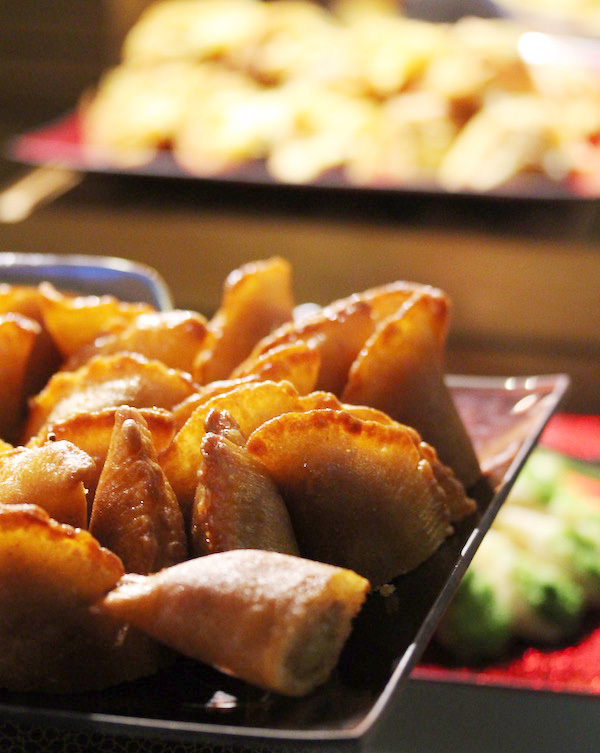 Each year, I try to do a roundup of 10 to 12 standout Ramadan offerings in Doha in the first week itself. But as I’m traveling out of town, this year’s is a shorter list. In each place I visited, I sought to find that little spark setting them apart from the pack. 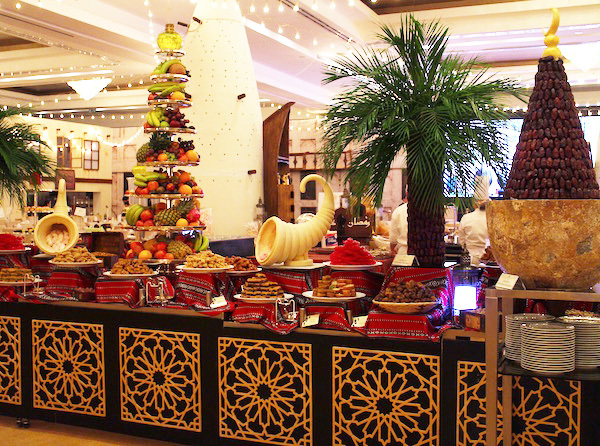 The hotel’s Restaurant Gallery is transformed into the Streets of Arabia, a souq-like venue for the Iftar buffet. 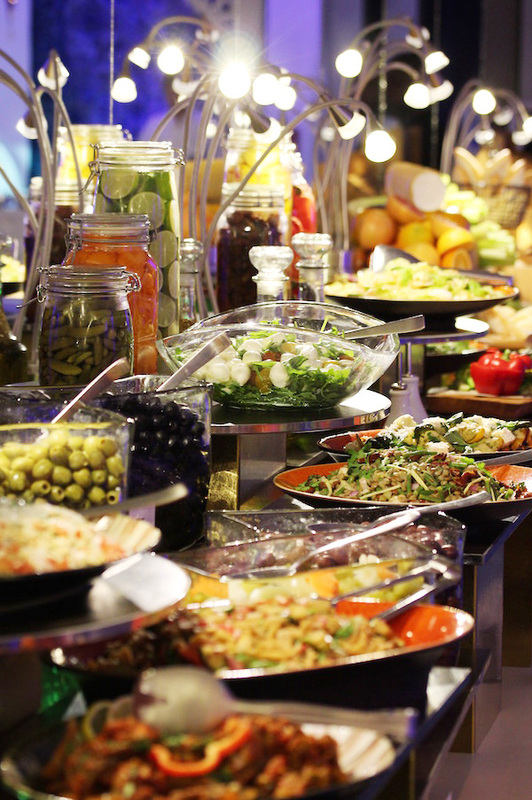 A collection of food stations line up along this avenue of tastes leading to the all-day dining outlet Corniche. More food awaits inside the restaurant, which also utilises a demonstration kitchen for hot foods. Regional cuisines from the Muslim world. What a brilliant approach. 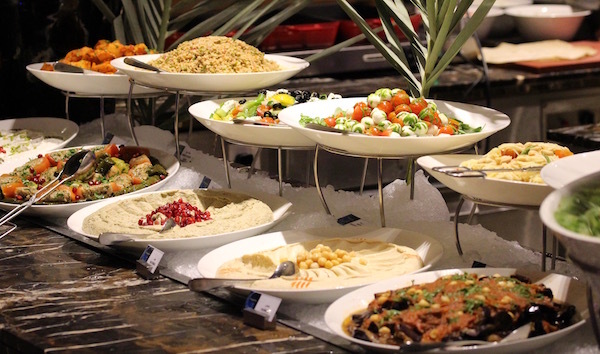 Instead of sporting the usual pasta and sushi, the Marriott has chosen to focus on food from countries with strong traditions during Ramadan. 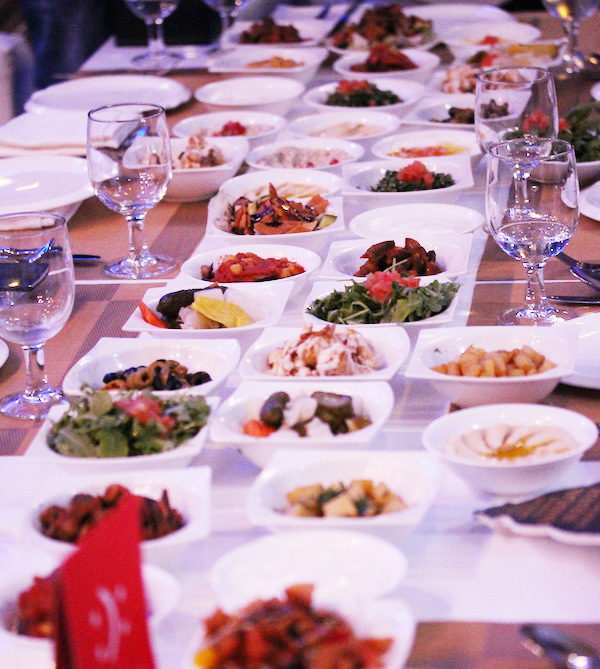 The separate counters for Turkish, Lebanese, Egyptian, Moroccan, and Sudanese dishes are definite standouts. Building on its ultra-popular, award-winning Friday brunches, the Four Seasons tent impresses with invitingly immaculate displays. Clever little touches keep things exciting, such as a tank with salads housed in individual terrariums for you to fish out (a hit with the little ones) and separate dumpling counters: for steamed and fried, naturally. Valrhona Chocolate Shawarma. You read right. 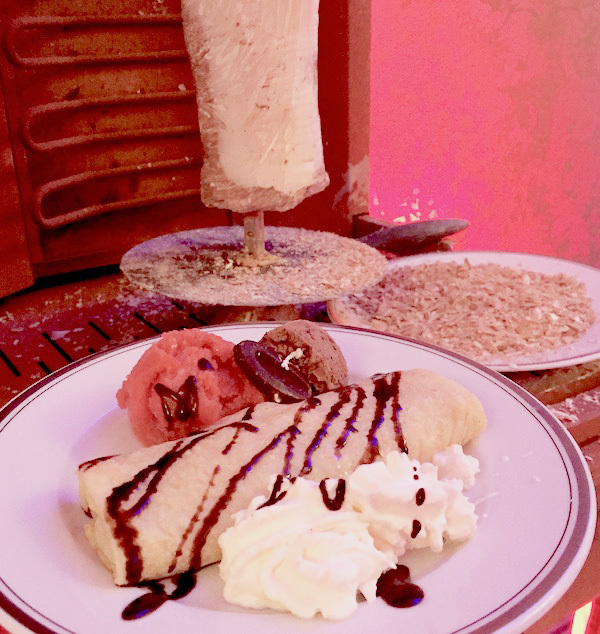 Imagine a torpedo of chocolate mounted on a spit to resemble shawarma, which is then shaved off and melted inside a crepe. The result is a hip-widening, joy-inducing, soul-affirming dessert so addictive you quickly understand why there’s a constant line, and you don’t mind standing in it. At least twice. The Grand Hyatt does things a little differently. Its Ramadanak Tent encompasses the entire lower lobby and adjoining all-day dining restaurant The Grill. They’re also separate experiences; you either dine at the restaurant portion or lounge over shisha and a la carte food items in the lobby. Camel Milk Panna Cotta. What a home run of a dessert. Not to mention delicious introduction to anyone curious about camel milk. Relax. It really doesn’t taste any different from cow’s milk. But the novelty factor alone gives you a terrific Doha story for that next meeting with the in-laws. 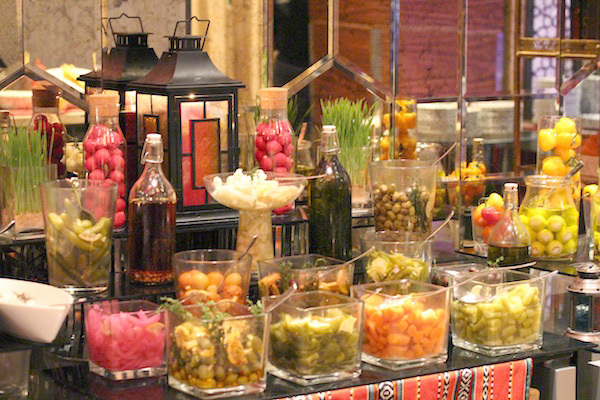 The warm, autumnal colours at Al-Jawhara tent set the mood for a relaxed evening. The ginormous ballroom is decked out in rich browns, burnt oranges and deep reds that make you want to linger, which is a good thing because you won’t believe how much food is there for your delectation. Sheer variety. The entire corridor is teeming with food stations on either side. I walk up and down the entire length several times — slightly overwhelmed — and keep discovering something new. At one point when I remark that the dessert selection is surprisingly petite, I am escorted inside where another two stations await and I am rightfully put in my place. 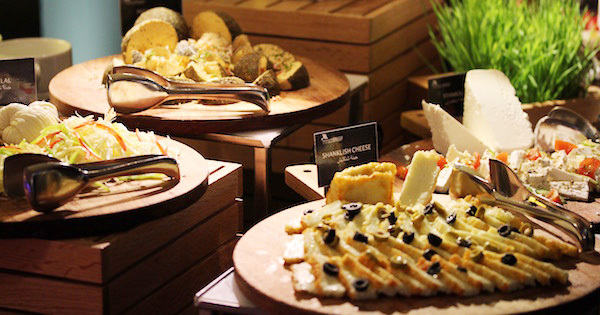 The foyer of the ballroom turns into a mini food paradise. A row of live cooking stations for stir-fries, sushi, shawarma and spaghetti (OK it’s really pasta, but I sometimes get carried away with alliteration) anchors one end of this paradise, with multitudinous other offerings piled onto circular buffets in the middle. Al Sufra’s Mezzes. The Marsa Malaz’s signature Levantine restaurant dons its party frock and shows us exactly how to boogie. The kitchen has a dedicated section overflowing with Arabic mezzes, each textbook in flavour and texture. I know most people aren’t going to be seduced to a tent by hindbeh or mouhammara; but they really outshine everything else. 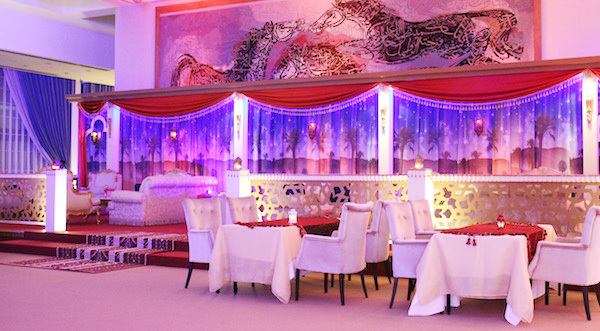 The main ballroom of the hotel becomes Wanassa, its Ramadan tent noted for plush, couch-style seats and a methodical seating arrangement that’s intimate without being overcrowded. A collection of majlis line the walls, providing diners with the choice for even more privacy. Unlike last year, all the food stations are now in the ballroom lobby, allowing for a more relaxed atmosphere inside the tent. Apart from the tent having one of the longest iftar hours around (until 9p.m. 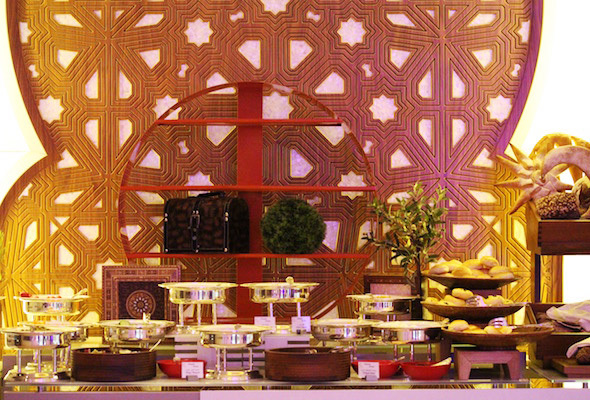 ), the buffet is notable for the many wondrous specialty Arabic dishes. Cheese such as shelal, shanklish, madjdouli and stanbolli have their own stand; olives in every permutation imaginable; labneh balls coated in zaatar, sumac, sesame and what-have-yous. 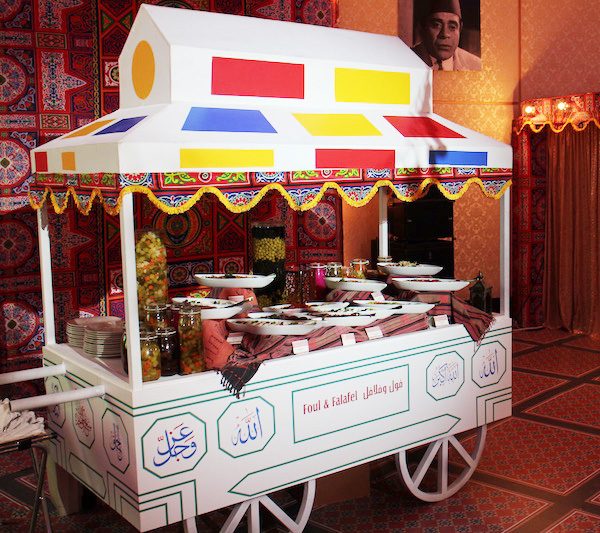 Iftar is held at the all-day dining restaurant, while the Hala Ramadan tent itself is on a different floor of the hotel. 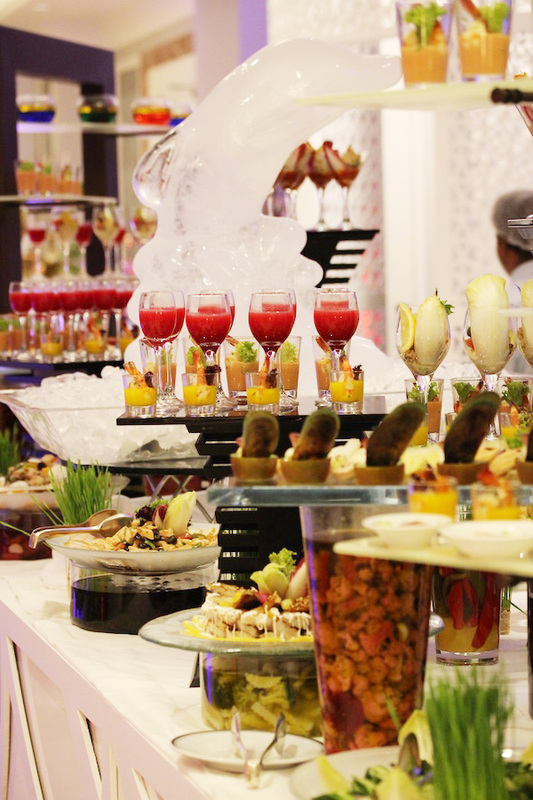 I attended suhour only, which consists of a modest dessert buffet and a la carte mezzes and mains served in very sensible portions to the table. A giant TV screen has been set up in the tent for EUFA Euro 2016, becoming the focal point of the venue. Football fans are certainly well catered for, with every table offering a good view of all the match action. The seating, too, is more living room than dining room, making the area more conducive for relaxation. 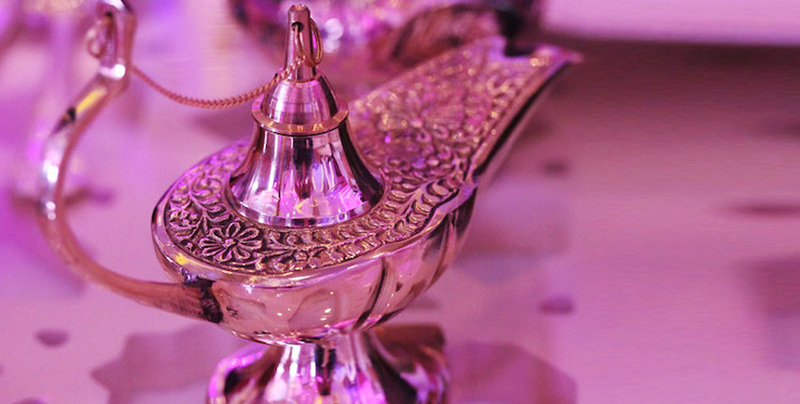 While iftar is held at the lobby restaurant, the Ramadan Tent in the convention centre wing has been set-up expressly for a suhour experience. From the moment you step in, you know realise it’s a different experience because of the plenitude of vendors selling gifts, much like a proper souq. A comprehensive menu with many options for light bites means you can have a thoroughly lovely meal without overindulging. The dondurma man serving ice cream with a bit of theater attracts the young and confounds the old; you really need to order one to see for yourself. In keeping with last year’s talk-of-the-town Ramadan Souq, The St. Regis has replicated the set-up, which simulates dining in the midst of souq courtyard. The massive ballroom can be bewildering and is bordered by food, with live cooking stations anchoring the four corners and the dessert taking up the very centre of the room. The carving station is a definite draw with turkey, lamb, beef and seafood for those seeking a proper roast dinner. But it’s the desserts that people can’t stop gushing over. Steamy hot puddings, delicately flavoured ice creams and towering displays of dates, macaron, cupcakes and fruit turn the area into a sweet paradise. 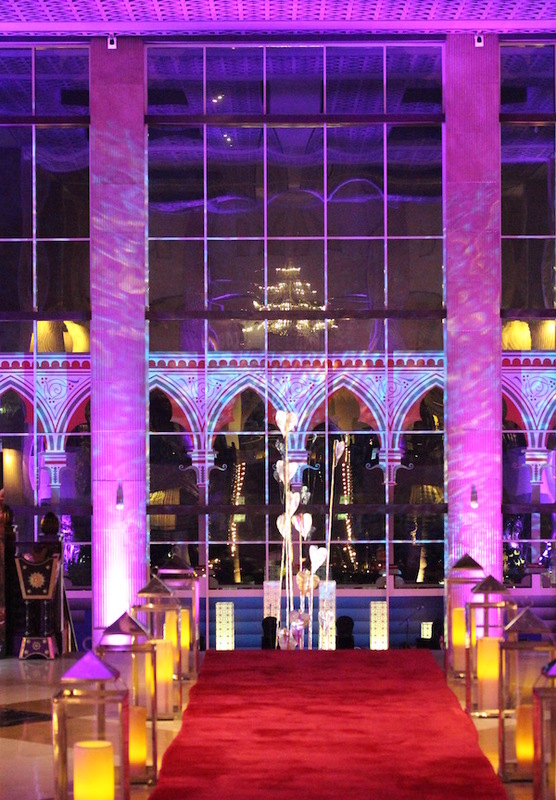 This ballroom outside the main hotel building has become something of a themed Ramadan destination. Last year, it was dessert-exclusive and catered to ladies seeking an elegant affair. This year, it’s become an Egyptian café for football spectators who don’t mind a boisterous evening. The food is all served from carts as though you’re dining on Cairo streets. 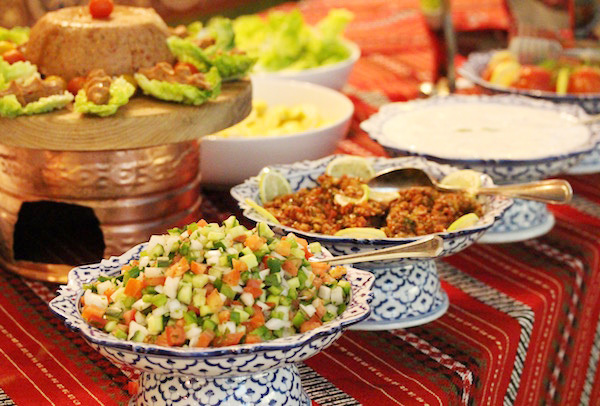 Although koshari and taamiya are noticeably missing, there are plenty of other Egyptian specialties to delight. The dessert counter is expressly Arabic in persuasion. And it’s a remarkable amount of food for a tremendously low price. You know it’s all about indulgence when you are greeted by ice cream at the entrance. And three different counters at that: one for sundaes, another for teppanyaki-style mix-ins, and a stand for stretchy, pliable Turkish dondurma. The intimately sized Sultan’s Tent has food stations aplenty and comparatively fewer tables, making for a more intimate meal. Greg Malouf. Wait a minute. 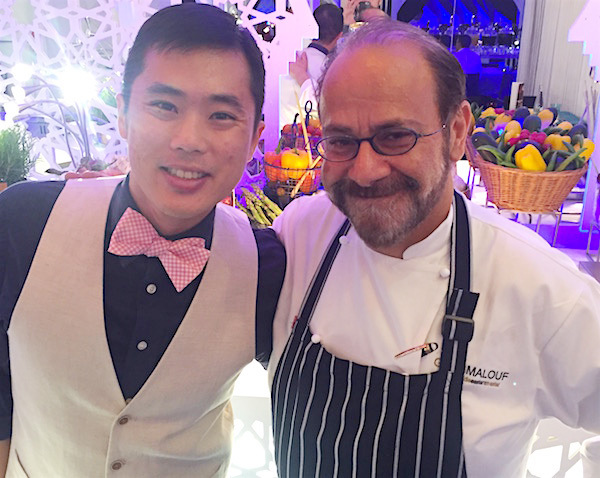 I meant, GREG MALOUF! Many call him celebrity chef; but I prefer to think of him as educator and inspiration, the doyen of Arabic cuisine in Australia. His seminal cookbook Arabesque was my early window into Middle Eastern flavours. What a coup for the W to have him incorporate his signature cooking style into the Ramadan spread. If you get a chance, please go meet the man; he’s triple AMAZING. Everything I love about this casual delicatessen – freshly made mezzes, home-style hot dishes, and a chock-full-o-yum shawarma – is put out on a buffet during iftar. It’s incredibly great value, especially when I typically spend more to have a light ala carte meal there whenever I’m in Landmark Mall. Kunafa. Baklava. Mafroukeh. 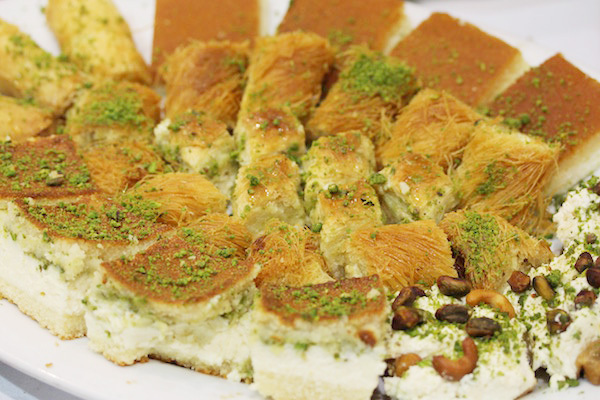 And any other sugar-soaked, golden Arabic pastry your little heart desserts. Dessert is a house specialty, and whatever special sweets Wafi Gourmet has conjured for the season to sell in the deli section, you’ll also find on the buffet table. This entry was posted in Reviews and tagged buffet, dining, dinner, doha, feature, hotels, iftar, Ramadan, restaurant, restaurants, suhour. I tried yesterday the W iftar and it was not as the last year they were better than this year . Hi Mouza_qa — Ramadan Kareem. The W has different theme. Last year the focus was on Turkish. This year it’s modern Arabic with the inclusion of Greg Malouf cuisine. But overall the layout and offerings are quite similar, I feel. Hope you get a change to try the others over the next month.